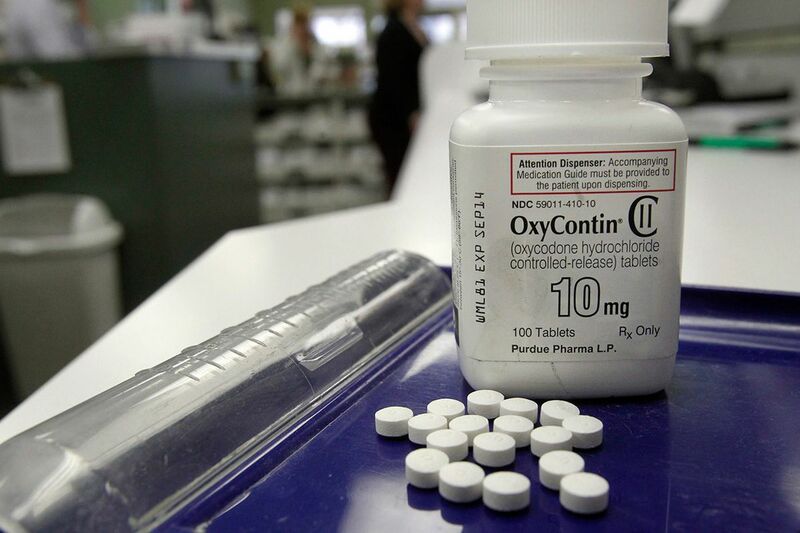 OxyContin is among commonly prescribed opioids. About 469,000 adults in Philadelphia — a third of the city's population — used a prescription opioid like Percocet or OxyContin in the last year, the city has estimated, based on a new survey, and more than 81 percent of them received the prescriptions from their health-care providers. Of particular concern, the city Public Health Department said Wednesday, is that 13 percent of all adults reported taking a prescription opioid in the last seven days, and more than a third of those were also on anti-anxiety medications like Xanax. The combination of opioids and those drugs, known as benzodiazepines, significantly increases the odds of an overdose. While the opioid epidemic has been getting a huge amount of attention, most national statistics have focused on illicit use — heroin or prescription painkillers that are bought illegally. At that point, users are already in trouble. "We wanted to understand how people were getting addicted in the first place," Health Commissioner Thomas Farley said. … and 81 percent got the opioids from a health-care provider. The findings of the survey indicate that a projected 168,000 city residents age 18 and older are using prescription opioids, putting them at higher risk of developing an addiction. That figure is "shockingly high," Farley said. "Doctors have given out way too many opioids." More than 900 city residents died last year from drug overdoses, most from heroin, fentanyl, and other opioids, a toll that is projected to exceed 1,200 this year. National surveys have found that four out of five new heroin users report having previously "misused" prescription pain relievers. The percentage of people on prescription pain medication who go on to use heroin would be minuscule, but even a "fraction ends up being a very large number of heroin users," Farley said. The sample size should be adequate given the city's population and the nonscientific nature of the questions, said David R. Gastfriend, a Massachusetts-based psychiatrist and scientific adviser to the Treatment Research Institute in Philadelphia. The institute was not involved with the survey. Gastfriend, who is also a consultant to the American Society of Addiction Medicine, agreed with Farley's goal of publicizing high use of pain relievers that were legally prescribed. "Illicit opioids is sort of an up-and-coming wave but [the epidemic of opioid addiction] didn't start there and it is not going to end there. The doctors were persuaded and were actually incentivized to prescribe opioids very, very freely," he said, referring to investigations that have found pharmaceutical companies were involved for years in encouraging physicians to prescribe the drugs inappropriately. A study published Wednesday in the American Journal of Public Health found that one in 12 doctors received money from drug companies marketing opioids between 2013 and 2015. Until physicians have incentives to reduce prescribing — not, Gastfriend emphasized, by cutting off pain patients, but by diagnosing their addiction and getting them into treatment — "we are not going to solve the problem." National surveys have found that young adults are most likely to "misuse" opioids. But the Philadelphia survey, asking about all prescription opioid use in the last seven days, found it was highest — 25 percent — among people ages 55 to 64. In the oldest age group, 65 and above, about 12 percent said they had taken a pain pill in the past week, comparable to the 13 percent across all age groups. Virtually all the older adults said their prescriptions had come directly from a health-care provider rather than a friend, relative, or dealer. One reason: Older patients are more likely to seek help for a variety of pains. And while there is little evidence that opioids are effective for most chronic pain, Farley said, doctors are more likely to view their longtime older patients as upstanding members of the community and are "fine giving them opioids." The city has been running a media campaign, "Don't Take the Risk," to raise awareness of the risks of prescription opioids. It also has distributed prescribing guidelines to physicians and worked with health systems and insurance companies to limit overprescribing. And the city is working through a broad set of recommendations issued in May by a task force appointed by Mayor Kenney, including exploring the highly controversial idea of creating safe injection sites where people addicted to heroin could use under medical supervision and also get other help, such as referrals to treatment. Percentage of Philadelphians who have used opioids in the past seven days, by age and by where they obtained the drugs.